What Wine Goes Best with BBQ? Jordan Mackay is the co-author, with the Austin-based BBQ star pitmaster Aaron Franklin, of Franklin Barbecue: A Meat-Smoking Manifesto. The book is a crazy success—a rare cookbook that bounded onto the Amazon best-seller lists—but one thing it leaves out is an answer to that vital question: What wine goes best with BBQ? Jordan Mackay is the co-author, with the Austin-based BBQ star pitmaster Aaron Franklin, of Franklin Barbecue: A Meat-Smoking Manifesto. The book is a crazy success—a rare cookbook that bounded onto both the New York Times and Amazon best-seller lists—but one thing it leaves out is an answer to that vital question: What wine goes best with BBQ? “Everyone talks about Zinfandel and barbecue, but I’ve never had much success with it, especially brisket. 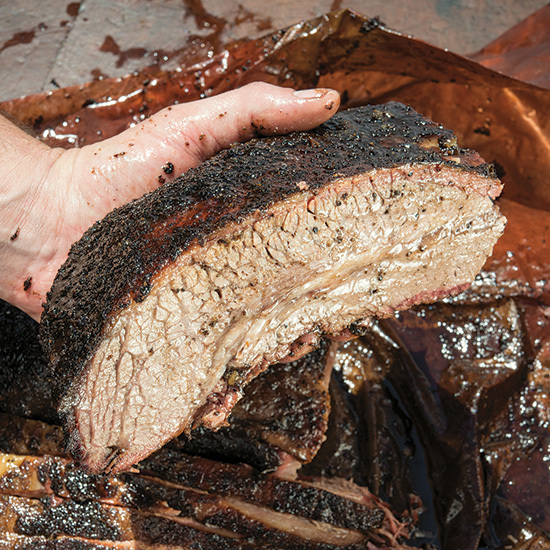 Brisket is so rich, so heavy, and it has this dense meatiness. What I like best with it is northern Rhône-style Syrah, whether an Hermitage or Côte-Rôtie, or something like Wind Gap from Northern California. Though he lives in San Francisco, Mackay has his Texas bonafides down; his family moved to Texas when he was 8, and he spent the majority of his life in Austin. But even that—and even co-authoring the book with Aaron Franklin—doesn’t allow him to skip the famous 4-hour line at Franklin’s. Or wine, Mr. Mackay. A cooler full of wine.